Lanzarote is a Spanish Island located on the eastern side of the Canary Islands, 7 miles north-east of Fuerteventura. It´s the fourth largest and the size of the island is a mere 13 miles wide and 40 miles long, so on you holiday you can travel to each and every part of the island and spend the whole day not having to worry about lengthy journeys. One of the most appealing aspects is the climate, as it offers warm temperatures and scarce rains all year around, turning it into a great place for those who wish to spend their holiday at the beach and enjoys as many outdoor activities as possible. Where to stay on Lanzarote? This island has everything from 5 star hotels to all-inclusive resorts, luxury villas or low cost apartments. Find the best deals on Lanzarote right here! If you come here for Lanzarote beaches, then we will show you pictures of the best right here. But there is more to see and do on Lanzarote than just the beautiful beaches. Where else can you go deep into a cavern in the middle of nowhere and find a huge amphitheatre used for live concerts, a place that doubles as a nightclub some evenings in the week. Visit “Cueva de los Verdes” (9 Euro for adults, open 10am to 5pm). If you prefer the more cultural aspects of this island, then it is best summed by the mere mention of one name – Cesar Manrique. His influence can be seen all over the island at places like Castillo de San Jose, Ceuva de los Verdes, Fundacion Manrique, Jameous Del Aqua, Mirador Del Rio, or Museo Campesino. Love cacti? You have to visit Cactus garden, a Scenery Artwork of César Manrique with over 1000 species in a terraced former quarry, featuring a cafe and a restored windmill. Located at Carretera General del Norte, s/n, 35530 Guatiza, open daily 10am to 5pm. La Graciosa north of Lanzarote. The little island next to Lanzarote (1.2 miles north) called La Graciosa is a just off the beaten path. Literally, as there are no roads on this little gem, only dirt tracks. Remember Treasure Island, the great kids book written by Robert Louis Stevenson, it is said to be based here. It is well worth a visit for the most beautiful lonely beaches and ferries to La Graciosa run every day (10 Euro for adults) from the small port in Orzola in the north of Lanzarote. Have a look at Googles Lanzarote Island map to find exactly where you want to go on your holidays. Probably the most unique attraction on Lanzarote Island. 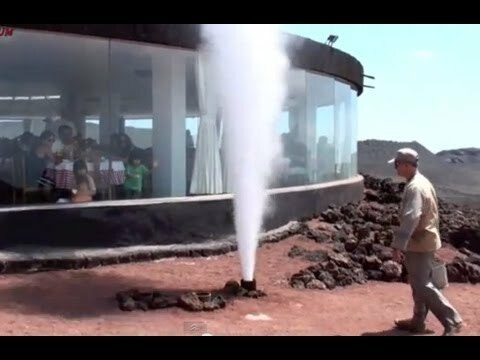 Do you know another place in the world where you can have your lunch in a cafeteria that is built on top of an active volcano, where the heat to cook your food comes from the volcano itself? Timanfaya or The Montañas del Fuego (Fire Mountains), were created in the 1730’s when more than 100 volcanos in what is now the National Park, rose up to devastate the southern part of the island. Eruptions lasted for six years and several villages were completely destroyed. The last eruption on the island was back in 1824. Because Lanzarote has only little rainfall and therefore only little erosion, the area appears much as it did at that time and in 1968 the area was declared a national park “Parque Nacional de Timanfaya”. You can make a full day of this trip and it´s a must see for any visitor to the island, because of its unique Martian like landscape and rare plant species. On entry to the national park (entrance 8 Euro for adults, open daily from 9am to 7pm, but from July 15. to September 15. till 5:45pm only), the first thing to catch your eye will be the camels and of course if you have kids, they want a ride! Camel ride upon the volcano on Lanzarote. The 25 minute camel ride upon the Volcano (6 Euro for adults) is undoubtedly great fun for all ages and one of the most classic pictures of Canary Lanzarote! At the Islote de Hilario, you can see a quite stunning demonstrations of just how hot the area is just below the ground. The temperatures a few metres below ground are a staggering 750°F to 1110°F. Dry bushes are thrown into a hole and in less than a minute, they catch fire! Water that is poured into a bore hole will erupte back and seconds later into the air as steam. Next up you´ll find the ‘El Diablo’ restaurant, another creation of the famous Cesar Manrique, whose influence is everywhere on the island. Here you can enjoy traditional Canarias food cooked using geothermal heat, that´s awesome. From here you´ll go on a coach trip of the National Park (part of the entrance fee). The coach stops at several strategic points in order that you can get some amazing pictures and videos. Still looking for accommodation on Lanzarote? Lanzarote offers a wide variety of beaches including black and white sand beaches. Stay with us to find the best beach on Lanzarote.